OK, it's a long way to November, but this cocktail is worth getting in a turkey mood early. 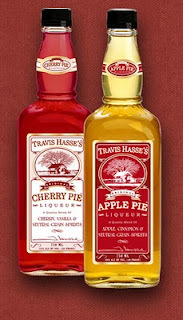 Thanksgiving Dinner is two parts Travis Hasse's Original Apple Pie Liqueur, two parts cranberry juice and one part Wild Turkey Bourbon. The aroma will remind you of holiday kitchen and the flavor has the right sweet and spicy notes to pull off the theme. The distiller suggests doing this as a shot.